There's really no need to rub your chopstick together. Chances are you won't get a splinter. Instead, you could be sending the message you think they're low quality chopsticks. Adding too much soy sauce and wasabi overpowers the taste of your sushi. Some chefs don't recommend adding either. Lee doesn't mind if diners add wasabi and soy sauce as long as they don't mix the two together in the small soy sauce dish. Dip nigiri in soy sauce fish side down so that the rice doesn't break apart or absorb too much of the soy sauce. It's perfectly acceptable to eat nigiri with your hands (actually, Lee prefers it if you do). Eat ginger on its own before or after bites, but not in the same mouthful as nigiri or rolls. It's a strong palate cleanser so should be consumed separately and sparingly. 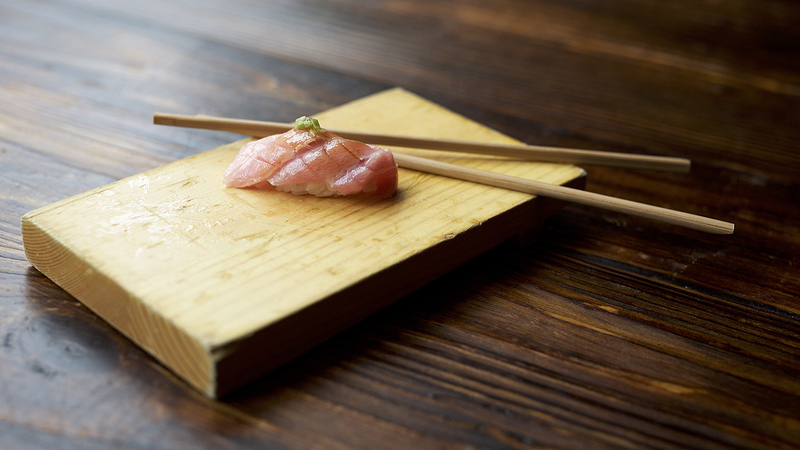 When eating or ordering nigiri, eat lighter tasting fish first. Then, eat heavier fish. Then, eat fatty fish (like salmon). Eat sushi rolls after sashimi and nigiri. Eat tamago sushi (egg) last. Eat the sushi right when it gets to the table. Don't let it sit too long. The rice and fish is best when still warm from the chef's hand. Eat miso soup anytime during the meal. It's even okay to drink out of the bowl.